The Gran Hotel Argentino is a standard class, 3 star property originally built in 1940 and renovated in 1994. The hotel has spacious rooms with a high standard of quality and comfort to ensure that your trip, whether business or pleasure, is a wonderful experience. The hotel is located downtown in the heart of the commercial and banking community. Complimentary ... Breakfast. One double bed and two sofabeds/ a private bathroom with tub, shower and bidet/ air conditioning/ color cable TV/ direct dial phone/ hairdryer/ safe in room. 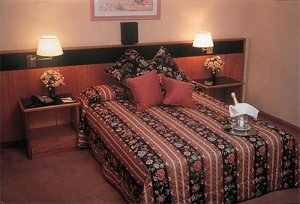 One double bed and a private bathroom with tub, shower and bidet/ air conditioning/ color cable TV/ direct dial phone/ hairdryer/ safe in room. Three twin bed/ a private bathroom with tub, shower and bidet/ air conditioning/ color cable TV/ direct dial phone/ hairdryer/ safe in room. Two twin bed/ a private bathroom with tub, shower and bidet/ air conditioning/ color cable TV/ direct dial phone/ hairdryer/ safe in room. Ministro Pistarini Airport -EZE-.. Upon leaving the airport take the Richeriant Highway until you reach Av 9 De Julio downtown. You will see the Obelisco. Aerodromo Tolosa Airport is located 38 miles west to the property. Aeroparque Jorge Newbery Airport is located 3 miles south to the property. Colonia Airport is located 38 miles west to the property. Attraction Puerto Madeso is located west to the property. Attraction San Telmo is located north to the property. Attraction Shopping Plaza is located south to the property. Attraction Tigre Delta is located 19 miles south to the property. Attraction Tren De La Costa is located 9 miles south to the property. Corporate Location Faculty of Bellas Aries is located north to the property. Corporate Location Faculty of Engineering is located north to the property. Corporate Location Government House is located west to the property. Corporate Location Palacio Congress is located east to the property. Corporate Location Palacio Tribunales is located southeast to the property. Corporate Location University of Salvador is located south to the property. Corporate Location Edif. Colonial del Casildo is located west to the property.